Rise Of The New Bull Market? We believe the following charts clearly show just how important these breakout patterns are for traders. This first chart shows the Stage 1 Basing formation that we’ve been following for quite a while with our Adaptive Dynamic Learning Cycles. These cycle projections help us to determine the future potential of any markets as well as help us to understand historical and current price cycle rotations. 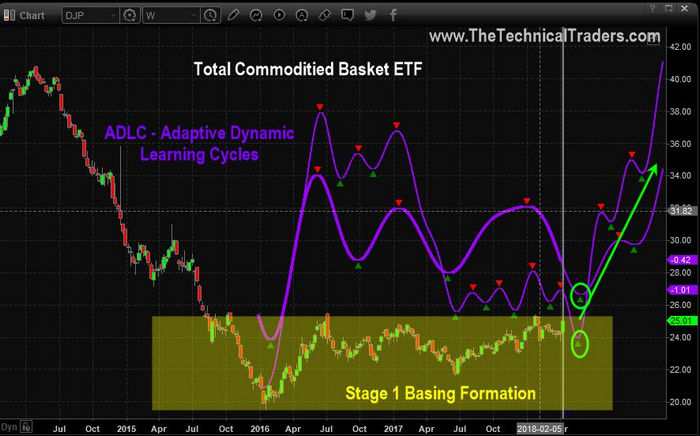 Right now, these cycle predictions are warning that a massive cycle bottom is likely to happen within the next 2 to 3 weeks followed by a massive upside price rotation in commodity prices. We don’t believe this future bottom cycle will be very deep – therefore we believe now is an excellent time to consider a positional trade expecting higher commodity prices in the future. 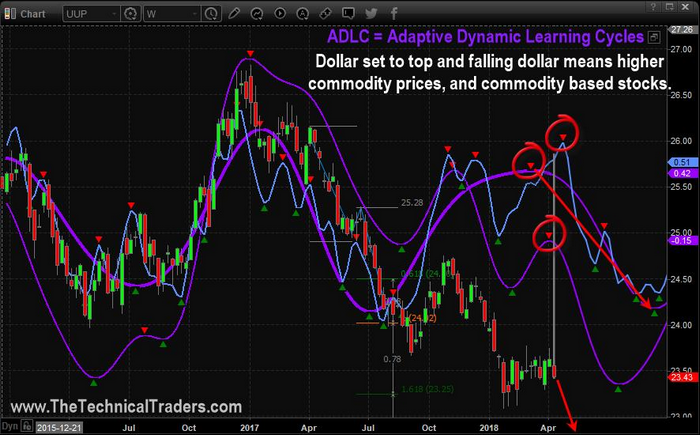 Conversely, our Adaptive Dynamic Learning Cycles are showing future weakness in the US Dollar.Combine these two cycle patterns, weakening US Dollar and potentially stronger general commodity prices, and we have an almost perfect setup for traders and investors. If the US Dollar weakens while external market factors (like foreign geopolitical tensions and trade issues) continue to drive the news cycle, we may be setting up for a very explosive upside move in commodities.